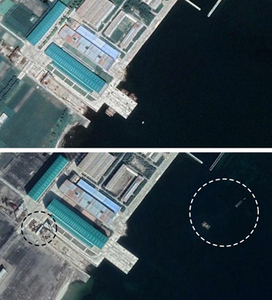 Images from March 23 show what appear to be submarine hull sections as well as equipment and supplies near the yard, but they can no longer been seen on April 5, suggesting "that building of a submarine... is continuing," it said. U.S. Under Secretary of Defense John Rood warned in a recent Senate hearing that the submarine technology "changes the defense equation in terms of where the origin could be, and what are other anti-submarine capabilities in a potential conflicts, how they could be utilized."